Omg this puppy at the shelter breaks my heart 😭😭😭 he looks so sad!! Someone adopt him he’s at the Roswell Animal Control. In a big empty cold room all by himself.. so sad I wish I could take him but sadly I have no room for a dog. Seems to be the case as poor HERBIE is really stressed at the ACC. He wants to be back home-- not at ACC. HELP! FRIENDLY HERBIE in grave danger 😢 URGENT! Time is crucial for HERBIE on the euthanasia list! they get only few day even hours.....so precious little time. 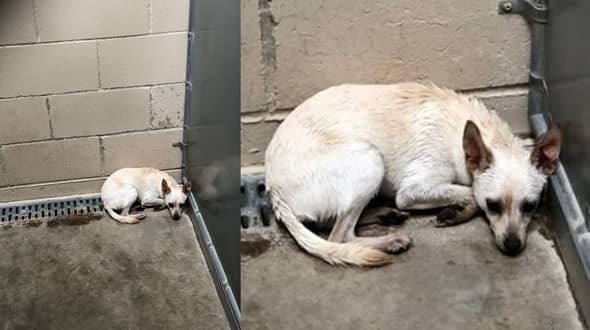 7 Responses to "In a big empty cold room all by himself..HERBIE at the shelter is heartbroken"
This breaks my heart to see these precious dogs dumped. Don't know how people live with themselves when they do this. My animals stay with me until their time ends. really? I pray this is correct.